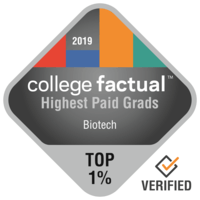 Discover which colleges graduate Biotechnology students who go on to earn top starting and mid-career salaries. Check out which colleges graduate the highest number of Biotechnology students. Biotechnology students make up the largest percent of the student body at these colleges, which could indicate a strong educational focus.